Not much has changed on the fishing scene in the last week and that is a very good thing. 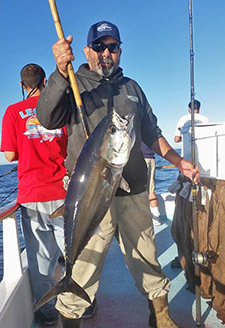 The yellows continue to bite up and down the coast and boats making the long run to Cortes Bank are still scoring bluefin tuna. At the same time, the bass bite along the coast is showing signs of improvement. The weekend weather forecast looks good so there are lots of great fishing options. Starting to the south, the 1 ½-day trips to Colonett have been loading up on the big yellowtail and rockfish. These trips normally start out fishing yellows in the morning and then switching to rockfish when the bite tapers off. If you’re heading out on one of these trips, I’d recommend bringing some large yo-yo jigs like a Tady 4/0 or a Salas 6X. These bigger jigs have been accounting for most of the yellows. Regarding rockfish tackle all you need is 2/0 to 4/0 hooks and some 12-16 ounce torpedo sinkers. 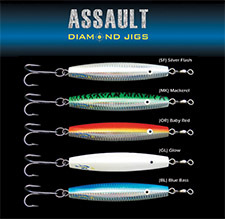 If you like fishing jigs for the rockfish, pick up a couple of the Ahi Assault Diamond Jigs in blue or green. 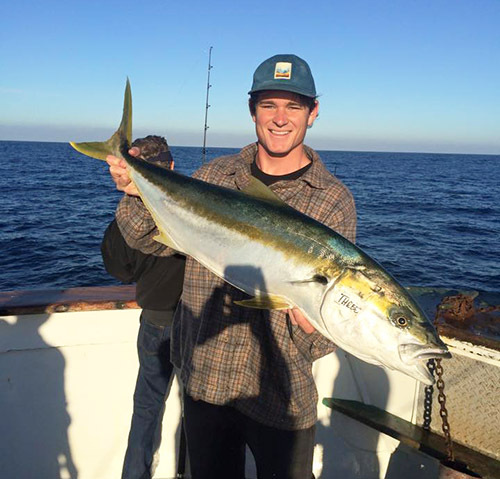 The yellowtail are biting at both the Coronado Islands and along the coast off San Diego. Most of the fish at the islands are small, but there are a few bigger ones being caught around the north end of the chain. The fish on the beach are still the big ones and if you’re there on the right day, you can get a good score. The New Seaforth out of Seaforth Landing had 32 fish on Wednesday morning’s half-day trip and backed it up with another 25 on the afternoon trip. These fish are all coming out of deep water. Private boaters shouldn’t get locked in on fishing the same areas as the sport boats. There are plenty of fish to be caught away from the fleet. Thomas Aranda proved that when he landed a 38-pound yellow while fishing halibut earlier this week. The fact that the fish ate a white scampi is testament to the fact that these yellows aren’t picky eaters. The next popular fishing area is Box Canyon and this is a spot that I would advise private boaters to avoid at all costs. Last week there were over 100 boats in a classic early season gangbang pattern. There are yellows being caught everywhere along the coast right now, so if you see the fleet hanging a right, then turn left and go look for your own fish. 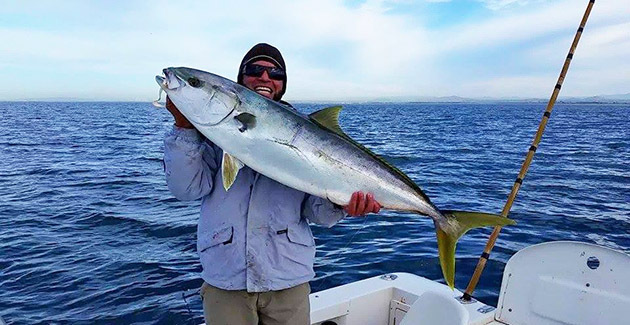 My friends John and Travis Curry fished out of Long Beach over the weekend and they reported biting yellowtail and very little boat pressure. There are fish biting in the Santa Monica Bay as well. 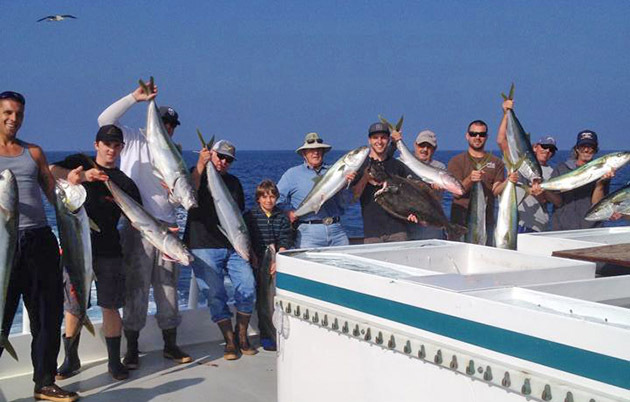 The Highliner out of Redondo Sportfishing got in on the bite, as did several private boaters. 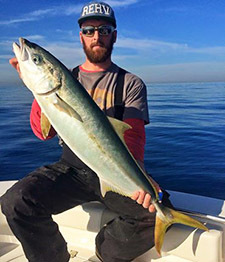 There are biting yellowtail scattered all the way up to Ventura; you just need to go out and find them. Heading offshore, the Cortes Bank kicked out more bluefin tuna for the boats that made the run last weekend. The Thunderbird out of Davey’s Locker in Newport Beach had over 40 tuna on their last trip and has another trip headed out this Friday night. Remember to bring light line and small hooks, as these tuna can sometimes be line shy. If you’re looking for something different, the bass bite is really starting to turn on along the coast. 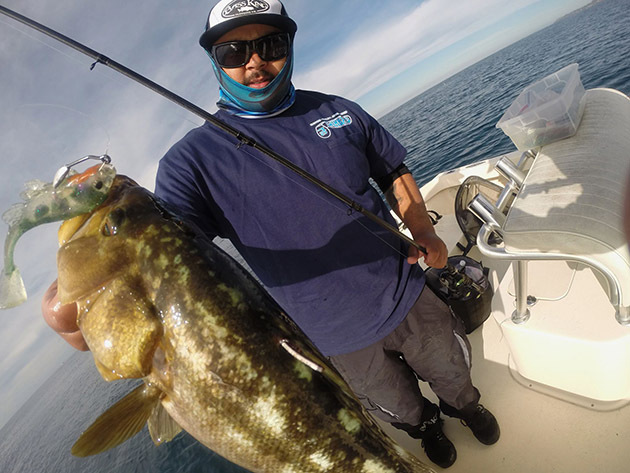 I fished La Jolla on Sunday with Corey Sanden and we had some excellent calico bass fishing. From the guys I’ve talked to, it sounds like the calicos are biting as if they are already in a spring pattern, so you can expect the bite to improve in coming weeks. 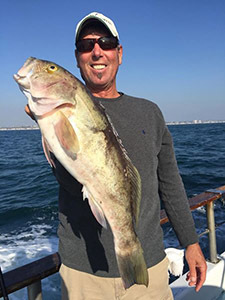 The 1/2-day boats from Newport Beach to Marina Del Rey have been getting some good scores on sand bass, with some larger fish in the mix. 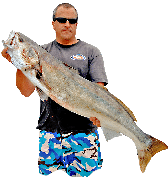 This continues to be a leadhead and squid bite for the most part for sport boats, but private boaters are getting a lot of action on swimbaits.